Aim: To show the use of fractional distillation for the separation of liquid - liquid mixtures in which the boiling points of the components are similar. To achieve a complete separation by distillation the vapour that condenses first may only contain particles (molecules) of the component with the lowest boiling point (the more volatile component in the mixture). This condition can only be satisfied when the boiling points of the two-components that are to be separated are very different. A rule of thumb is that for a normal distillation the boiling points must differ by at least 25 °C. Even if this condition is met the distillate will contains particles (molecules) of the less volatile component and the separation is never complete. In practice use is made of fractional distillation, a technique that gives a better separation. With this technique it is possible to separate mixtures of liquids whose boiling points are considerably less than 25°C apart. Again however this technique does not give perfect separation. This more effective separation is achieved by placing a fractionating column (a Vigreux column) between the distillation flask and the (Liebig) condenser. This column is a tube filled with glass beads or rods, or a tube in which the walls have many inward-pointing indentations (see illustration). Higher up the column the temperature is lower, and the vapour-mixture condenses. The rising vapour must pass through the falling drops of distillate to reach the condenser. Because of this close contact between the rising vapour and the falling condensate only the particles (molecules)with the lower boiling point can rise up the column. As a result, the higher up the column we go, the richer the vapour is in molecules of the most volatile component. The contribution of every component to the total vapour pressure is directly proportional to the mole fraction X of this component multiplied by its vapour pressure in a pure state, P0. This applies to an ideal mixture which can thus be separated effectively by distillation. The efficiency of separation increases as the difference in boiling points increases. The figure below shows the change in composition for a mixture of two components that obey Raoult’s law. The yaxis gives the boiling points of the pure components of the mixture (T1 and T2). 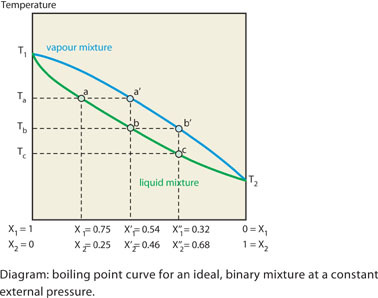 The two points are joined by two curves that show the change in composition of the liquidmixture (bottom curve) and the vapour-mixture (top curve). The x-axis represents the composition of the mixture. X2’ = 0.46 respectively. From this we can see that the vapour is richer in the more volatile component, 2. If vapour with this composition is condensed, then the mixture obtained is enriched in the most volatile component. This represents one step in the distillation process. The vapour phase that is in equilibrium with the liquid of composition b has a composition b’ with the following mole fractions: X1’’= 0.32 and X2’’ = 0.68. On cooling, the resulting liquid has this composition c. This is the second distillation step. As a result, the mole fraction of the most volatile component (component 2) increases further with every distillation step. In fractional distillation the number of distillation steps is much greater than in normal distillation. If Raoult’s law is not obeyed, deviations arise. In the case of a positive deviation the vapour pressure of the binary mixture is higher than that predicted by Raoult’s law. In this case the mixture boils at a lower temperature. Negative deviations, on the other hand, reduce the vapour pressure and raise the boiling point. For positive deviations it can sometimes happen that the boiling point of the mixture is lower than that of the more volatile component. Under such circumstances a minimum in the boiling point curve will be present for a certain composition. This mixture is termed a positive "azeotrope", which means literally "cannot be changed by boiling". For this minimum-boiling-point mixture the composition of the liquid phase is indeed identical to that of the gas phase. This means that the mixture at this point behaves as a pure substance. Moreover since the composition of the vapour phase is identical to that of the liquid phase the mixture cannot be separated further by distillation. 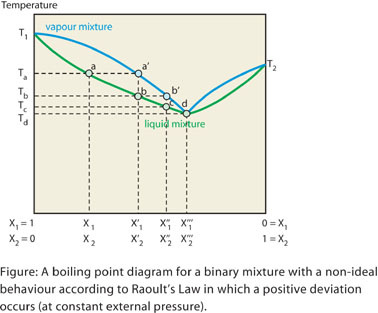 The diagram below shows a boiling point curve for a two-component mixture where the positive deviations to Raoult’s law lead to a minimum boiling point. An example of this is the water / ethanol mixture, which at a certain composition shows a lower boiling point (78.2 °C) than pure ethanol (T2 = 78.3 °C). At this point the water / ethanol mixture contains 4% w/w of water (3% v/v, X1’’’ = 0.09), and 96% w/w ethanol (97% v/v, X2’’’ = 0.91). Negative deviations from Raoult’s law sometimes lead to a maximum in the boiling point of the binary mixture. For such a mixture the composition of the two phases is once again equal. This mixture is a negative azeotrope. An example is the mixture of water / 20.2% w/w hydrogen chloride, with a boiling point of 108.6 °C, which is higher than that of pure water (T1 = 100 °C). Negative deviations from Raoult’s law arise when the interactions between dissimilar molecules are stronger than those between similar molecules. The mixing process is accompanied by generation of heat (an exothermic mixture). Positive deviations from Raoult’s law can have two possible causes: (1) the interactions between dissimilar molecules are weaker and the mixing process is endothermic; or (2) the molecular disorder in the mixture is less than that envisaged by Raoult’s law. This explains why some exothermic mixtures, such as the ethanol / water system, can nevertheless exhibit positive deviations. 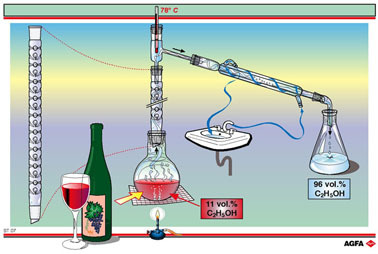 In the example of illustration ST07 the starting point is wine. Wine has an ethanol content of something more than 10%. Fractional distillation gives a mixture containing 96% w/w ethanol and 4% w/w water. To obtain 100% w/w ethanol the mixture must be treated further with a drying agent such as CaCl2.